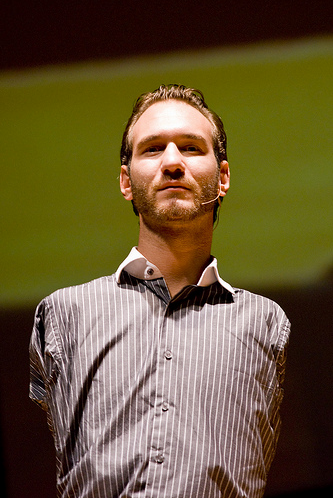 Imagine waking up one day without any arms or legs .How different your life would be !! Luckily you wake up and jump out of your bed and swing your limbs in every possible direction . It was all just a dream . 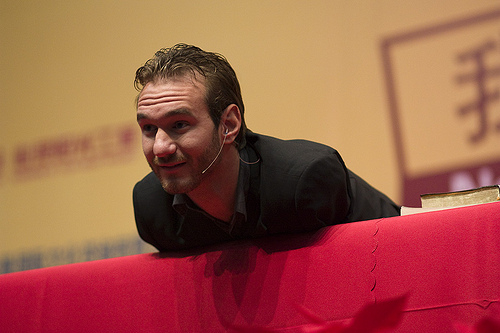 Sadly , this so called ‘dream ‘, turned out to be very real for Nicholas James Vujicic (he is better know as Nick Vujicic) . This post is dedicated to him. Born in Melbourne , Australia ; he was diagnosed with a rare disease known as tetra-amelia. His life wasn’t like a bed of roses. He faced numerous hardships on a daily basis . Growing up as a disabled child , he was often subjected to a lot of bullying and every now and then he would think about committing suicide . After a lot praying to God , to grow his arms and legs , he found that the regular stuff he did really inspired the average man , in ways he couldn’t imagine . Over time, he started his very own non profit organisation ‘Life Without Limbs‘. Today, he travels the world , inspiring minds and warming the hearts of millions. Personally , I can’t fathom how he does all the basic everyday stuff , like combing his hair , brushing his teeth , shaving his beard ,using toilet paper! . If you think you had it bad , think about him . If you feel your life is full of crap , think about the amount of crap he had to deal with . He really din’t have it as good as you do .But that never stopped him. You know how they say, “If you think your life’s bad, think again, cause there’s always someone out there who’s got it worse”. I guess this is what they meant.